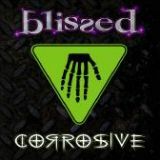 Blissed is a hard rock outfit that released their first full-length album Waking Up The Dead in 2002. Originally including former Stryper drummer Robert Sweet in the line-up, he left prior to the recording of their latest album Corrosive and was replaced by Nathan Kojak. Rounding out the line-up of Blissed is lead vocalist/guitarist David Pearson, guitarist Jeff Miller and bassist Geoff Breen. I've read some very positive reviews for this album and I guess it really depends on what you are looking for a in band. The sound of Blissed can be described as melodic hard rock or metal with 80's style vocals combined with sludgy and de-tuned guitars in an attempt to produce a "modern" hard rock sound. Many of the tracks feature the same sort of booming de-tuned guitars with a production that lacks all the polish of the melodic hard rock of the 80's. Vocalist David Pearson has the same sort of high pitched Michael Sweet (Stryper) or Dennis DeYoung (Styx) style of voice that for the most part, doesn't fit the attempts at producing a more "menacing" and foreboding sound. The vocal melodies even take on a more "pop" edge with several tracks. A couple of songs are worth mentioning that seem to rise above the monotony namely Superheroes, a track that actually has some catchiness to it and Run, a track that falls more into the traditional hard rock style with it's power ballad approach and emotional lead vocal. Rise takes on a more aggressive tone and is much more riff driven than anything else on this album. The solid catchy riffs actually work very well with this one. Bittersweet attempts to venture into the Zeppelin orchestrated/acoustic guitar/voice type of arrangement that although initially shows promise, eventually yields forgettable results. Monster is the band's attempt at a more menacing tone with slow and trudging de-tuned guitars and although there is some catchiness, doesn't work well either. In listening to this album, you get the feeling of some seasoned veterans trying to "modernize" their sound much in the same way that Dokken tried in the 90's in an attempt to deliberately target a younger audience. Very often, that sort of thing just doesn't work (although the latest Europe album may be one of the few exceptions). This band has a decent melodic sense but it doesn't fare well with the de-tuned and sludgy sound. David Pearson has a very strong voice but needs to stick to more traditional hard rock music that has much more melody than this album does. With very few melodic hooks or catchy aspects to their songs, what you are left with is an album that although seems "hip" and very in tune with the times, actually has very few redeeming qualities.